Saying that I ‘like’ chocolate is very much an understatement if there ever was one. I eat chocolate every single day. Do you think I’m lying? Go ahead and fumble through my pantry and you’ll find at least one (but usually two to three) bars of Lindt 70%. Or Dagoba. Or some Scharffen Berger. Dolfin (probably my favorite after my staple Lindt). Amano. Christopher Elbow. Eating a few squares of dark chocolate used to me my daily ritual, but now it’s mine and Matt’s. I don’t think he ever appreciated chocolate as much as he does now. Beyond my daily ‘indulgence,’ I can rarely pass up a molten chocolate cake, or a chocolate croissant, or chocolate gelato (I mean sometimes I wonder why other flavors even exist). You won’t ever catch me ordering a fruity panna cotta for dessert at a restaurant. No ma’am/sir. Luckily, it turns out I’m not the only one that has a passion for chocolate. Not just any kind of chocolate–super dark, rich chocolate that stands far, far apart from other beloved desserts like KitKats and M&Ms. Much has been written about the perfect chocolate chip cookie, but to my great surprise, much less has been written about the perfect chocolate cookie. One that hits your taste buds with the same power as a square of 70%. Melts on your tongue and reminds you of a deep, black espresso, or a full bodied wine. I found my recipe in Clotilde Dusoulier’s book, Chocolate & Zucchini (the name of her famous blog). 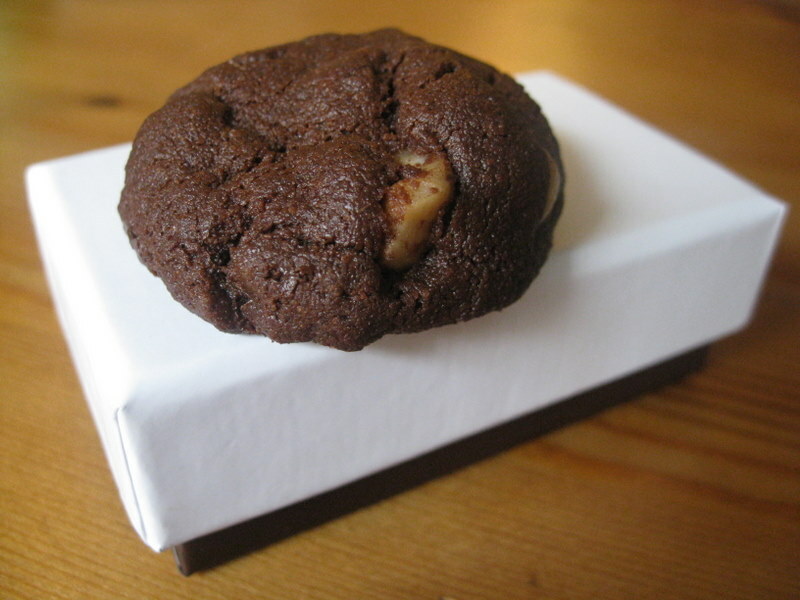 The first time I made her very chocolate cookies, one-bite little wonders, I was floored. Never had I tasted a chocolate cookie that tasted so much like those little squares of chocolate, but with the added benefit of a crumbly texture, accented by melted chocolate. For my next try, I decided to take these cookies to the next level, by adding a pinch of cayenne pepper and some chopped, toasted hazelnuts. 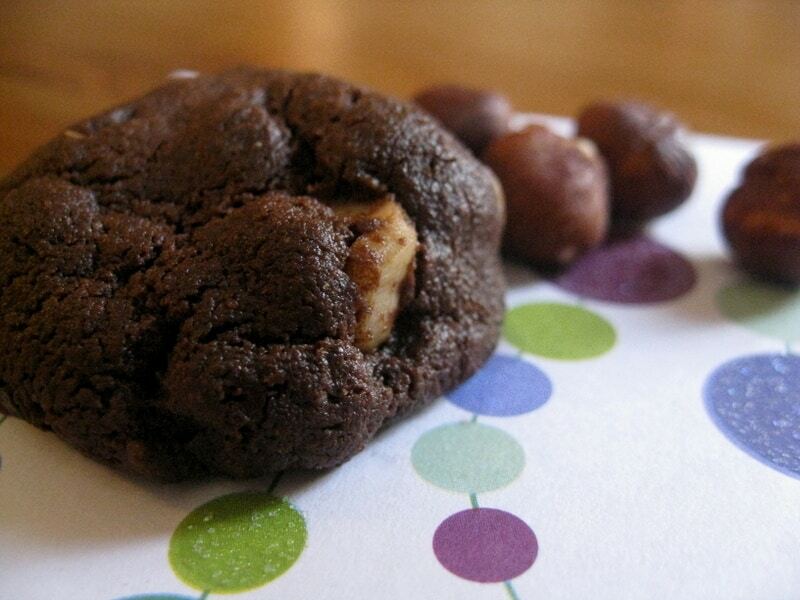 The combination of the cocoa powder, melted chocolate and chopped chocolate are really key for this cookie. The hazelnuts add the perfect texture contrast and also make these just a little reminiscent of my other favorite thing: Nutella. You might be tempted to make these cookies bigger, but trust me on the teaspoon. You’ll want them to be two bites and two bites only (don’t worry, you can have three…or four). The chocolate flavor is that intense. These aren’t for the weak of heart. They’re perfect with coffee. And even more perfect with a glass of red wine after dinner. You don’t have to freeze half of the dough, but you just might want to…If you want these to last for more than a day. 1. Combine the dry ingredients (flour, cocoa powder and baking soda) in a medium bowl. 2. Chop half of the bittersweet chocolate into chocolate-chip sized chunks and set aside. 3. Bring a small pot of water to a boil and set a metal bowl over the top. Place the rest of the bittersweet chocolate into the bowl and stir until it is completely melted. 4. Toast the hazelnuts: place them in a dry skillet over medium heat and toss around with a wooden spoon for a few minutes. Then, carefully pour them into a towel and rub off the skins. Chop into chocolate-chip sized pieces and pour into the chopped chocolate set aside. 5. In a food processor, combine the butter, sugar, sea salt and vanilla. Blend until it is creamy and all of the ingredients are incorporated. 6. Pour in the melted chocolate and pulse to mix. 7. Now, add the dry ingredients and a pinch of cayenne and blend until the mixture is just combined. 8. Fold the dough into a bowl and pour in the chocolate chunks and hazelnuts. Use your fingers to combine–the dough will be thick. 9. At this stage, you may decide to freeze half of the dough: roll it into a ball and cover tightly with plastic wrap–it should last for a few weeks in your freezer. When you’re ready to make more cookies, just lay the dough out at room temperature for a couple of hours. 10. Refrigerate the rest of the dough for about 20 minutes. 11. Pre-heat your oven to 350 degrees F and line a baking sheet with parchment paper. Using a rounded teaspoon, form the dough into little balls and place them about 1/2 an inch apart from each other. Bake for approximately 10 minutes: the cookie should still feel quite tender to the touch, but the bottom should be firm. Don’t worry, as they cool, they’ll develop an irresistible crumbly texture. Don’t be walking around your house without a napkin for these! The term “the war on drugs” was first used by U.S. President Richard Nixon, and is rooted in a quintessentially American brand of fuzzy, distorted optimism. Nixon declared a war on drugs in 1971, but the term really reached the height of its use in the 1980s. Offering an idealistic form of distorted Americana that merges mid-60’s/early-70’s folk rock with mid-80’s noise pop, Philadelphia’s The War on Drugs is, in this sense, aptly named. 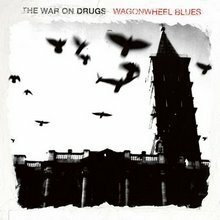 However, the music on their debut album, Wagonwheel Blues, is more ‘pop’ than ‘psychedelic’, and for this reason is better paired with Kasey’s triple chocolate cookies than with magic brownies.